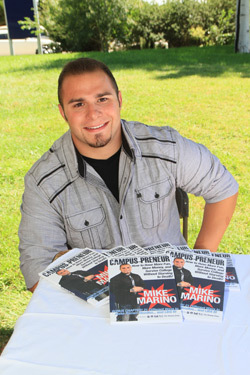 PUEBLO – Colorado State University-Pueblo Senior Mass Communications major Mike Marino is proof that college students don’t have to struggle financially while earning a degree – and he has written a book outlining a road map to success. 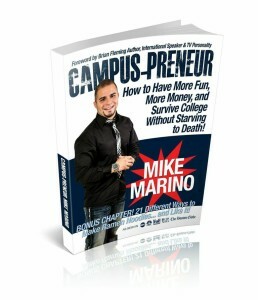 In his new book, Campus-Preneur: How to Have More Fun, More Money, and Survive College Without Starving To Death, Marino outlines the path he took that transformed his life from a suicidal teenager with no hope for the future into one of the hottest youth speakers in America today. A recent article on CBS Money Watch stated that 73 percent of college seniors were looking for work, while 46 percent of graduates in the past two years say they are underemployed and working in jobs that do not require their college degrees. Marino wants all college students to learn that the simple small choices made in life can and will change your life. His past reveals stints of drug abuse, rebellion, and even suicide attempts, but his life turned around when he realized that other teens and young adults were going through the same hardship he endured. “There are opportunities everywhere if you have the knowledge, mentors and desire to take action,” said Marino. While unemployment has dropped in recent months, job prospects for college graduates still seem bleak, but Marino remains adamant and passionate about teaching other students about entrepreneurship. In his book, Marino advocates for entrepreneurship, teaching students to spend the money they already have and learning how to tap into the extra "non-traditional income streams" that surround them every day. In between classes as a senior mass communications student, Marino spends his time developing his business and speaking to colleges, churches, and even businesses about how to make great choices, getting the spark of entrepreneurship and even launching their own business. He has lined up a nationwide speaking tour and hints that another book is in the works. “Needless to say, my schedule is hectic, but my passion for helping others is the fuel that drives me,” said Marino. Unlike many aspiring authors, Marino struck gold with his first submission to a publishing house as Frisco House Publishing signed him immediately. The time from idea to published book was about four months, but Marino said it would not have happened without his mentor Brian Fleming, a wounded veteran and now author, inspirational speaker and television personality who Marino met through a mutual friend about four years ago. Marino has offered to sign books if interested readers buy book from him, but Campus-preneur also is available in ebook form on Amazon, Kindle, Ibook, Kobo, nook, Copia, and through Barnes & Noble. To find out more, Marino can be reached at 719.406.9039, 719.240.0632 or campuspreneurbook@gmail.com.